Can overpower, recommend 5-15% range for wearable fragrances. Juniper Berry Essential Oil has a fresh, rich-balsamic, woody-sweet and pine needle-like odor reminiscent of evergreen oils. The plant is small bushy shrubs or tree, 3-35 feet in height growing at an altitude ranging from 8800 to 15,400 feet in the Himalayan region . The berries are plucked from the branches of the plant once a year and dried and ground before distillation. 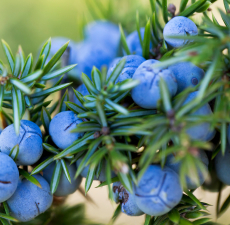 Juniper Berry Essential Oil is credited as being a supportive, restoring, and a tonic aid. It is excellent for meditation and is a popular oil in weight loss and detoxification blends, because of its diuretic properties. It is also considered purifying and clearing for the mind. In traditional Indian medicine, the oil is applied externally to relieve rheumatic pain to counteract alopecia; as a styptic and to wounds. Juniper can overstimulate the kidneys, so do not use it when they are inflamed or infected. Juniper Berry Essential Oil is non-irritating and non-sensitizing. Avoid use during pregnancy.